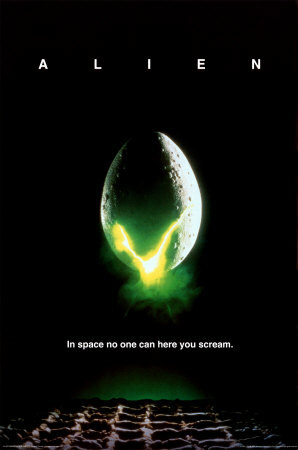 The tagline of Alien describes the movie well: “In space no one will hear you scream.” I hope no one watches this movie alone because you are likely to do just that…scream! I have never seen a movie that scared me, but this one made me jump several times in my theater seat. Released in the summer of 1979, Alien made Sigourney Weaver a star. It is her character, Ripley, who makes the movie so exciting. 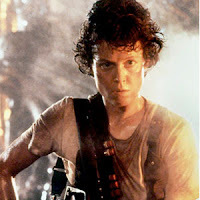 I love strong women movie characters and Ripley is right there with Princess Leia from Star Wars. She is intelligent, courageous, and even loves the ship’s resident cat, Jones. Alien begins with the Nostromo, a cargo ship returning to Earth carrying 20,000,000 tons of mineral ore. The ship’s crew resides in deep sleep chambers in order to make the long journey home. However, after the ship’s computer awakens them, they realize they are only halfway back to Earth. The seven crew members are: Captain Dallas (Tom Skerritt); Executive Officer Kane (John Hurt); Navigation Officer Lambert (Veronica Cartwright); Warrant Officer Ripley (Sigourney Weaver); Science Officer Ash (Ian Holm); and the two ship engineers, Parker (Yophet Kotto) and Brett (Harry Dean Stanton). Captain Dallas soon learns why they have been awakened. The Nostromo’s computer, named Mother, has picked up a distress transmission from an unknown planet. Engineers Parker and Brett don’t think they should investigate this distress signal. However, Science Officer Ash says that their employers have written in their contracts that all distress calls must be investigated. When Navigation Officer Lambert discovers the origin of the distress call, Captain Dallas, Executive Officer Kane, and Lambert go to investigate. The planet is a horrible place with constant storms making their journey difficult. Soon, they discover a crashed space ship and the body of its pilot, who apparently died long ago. They notice that the bones inside the dead pilot’s chest look like they exploded from inside. Kane wonders throughout the ship and discovers a large chamber covered in a mist. He trips and falls over the edge and lands on a floor below. He notifies Dallas that there are hundreds of cylinder shaped things that look like eggs. Kane sees one of the eggs open. He peers closer and something jumps out. Dallas and Lambert return to the Nostromo with Kane, who has something attached to his face. Officer Ripley refuses to let them inside the ship, stating that they need to be quarantined because they could infect others. Dallas and Lambert scream to Ripley to open the hatch and let them enter with Kane, but she adamantly refuses. Ash suddenly opens the hatch and Kane is taken to the sick bay. After removing Kane’s helmet, they see the alien life form is hugging his face with its tail tightly wrapped around his neck. Ash tries to get the alien off Kane’s face. He even cuts one of the alien’s appendages only to discover that its blood is an acid so powerful that it drips through the floor of the ship making holes. Ash concludes that trying to remove the alien will kill Kane. Hours later, the alien appears to be dead and off Kane’s face. He seems to be fully recovered. However, while eating a meal with the crew, Kane suddenly goes into convulsions. When the alien implanted in Kane by the facehugger burst from his chest, I nearly jumped out of my theater seat. This is one of the most famous science fiction movie scenes in history. The rest of the movie is incredibly tense as one by one the crew members are forced to confront one of the scariest, most terrifying aliens in the history of cinema. From that shocking scene, the cleverly-written Alien moves speedily to its surprise ending (indeed, it’s my favorite science fiction movie ending). Ridley Scott, who helmed Alien, has been nominated for three Academy Awards as Best Director for Thelma and Louise (1991), Gladiator (2000), and Black Hawk Down (2001). Alien won the Academy Award for Best Visual Effects in 1979. I think Scott deserved to win an Oscar for best director for Blade Runner (1982), which is an outstanding science fiction movie too and very original for the time it was made. After her star-making performance in Alien, Sigourney Weaver starred in the sequel Aliens (1986) directed by James Cameron. She was nominated for an Oscar for Best Actress in a leading role for Aliens, but didn’t win. It is an awesome sequel and the best sequel to any science fiction movie I have ever seen. The best sequel to any movie in my opinion would be The Empire Strikes Back, but to me Star Wars movies are simply in a class of their own. Alien and Aliens spawned four sequels. Alien3 (1992) and Alien: Resurrection (1997) star Sigourney Weaver as Ripley. The other two sequels, Alien vs. Predator (2004) and Aliens vs. Predator: Requiem (2007), didn’t feature Ellen Ripley. I am such an Alien fan that I own all these movies on DVD. 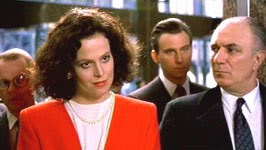 Sigourney Weaver furthered her fine acting career by making other notable films, such as: Eyewitness (1981) with William Hurt; The Year of Living Dangerously with Mel Gibson (1982); Gorillas in the Mist: The Story of Dian Fossey (1988); and Working Girl (1988). She was nominated for an Oscar for Gorillas in the Mist for Best Actress in a leading role and also as Best Actress for a Supporting Role for Working Girl the same year. She is an outstanding actress and I can’t believe she has never won an Oscar. Dan O’Bannon and Ronald Shusett wrote the screenplay. H. R. Giger is famous for the Alien art work used in the films. Jerry Goldsmith wrote the music, which (needlessly to say) is on my iPod. There are so many interesting facts about Alien I will just mention a few of them. The only actor who really knew the details about the chest bursting scene was John Hurt who played the unfortunate Kane. The other actors knew the basic facts, but not all of them. The shock on Veronica Cartwright’s face is great because she was not expecting to be splattered with blood. Ridley Scott wanted real reactions from his actors. Translated into several foreign languages, the movie is often called Alien: The 8th Passenger. The movie was first entitled Star Beast before it was changed to Alien. Originally, the character of Ripley was going to be a man; I am sure glad that was changed. There were 130 eggs made for the alien ship chamber. Ridley Scott had difficulty in getting Jones, the ship’s cat, to hiss and back away from the Alien. A screen was put in front of Jones with a German Shepherd on the other side. When the screen was lifted naturally, the cat was shocked by the dog into backing away from him and hissing too. Scott did all the hand held camera scenes himself. The screen test that earned Weaver the role of Ripley was her last speech in the movie. The producers of the It! Terror from Beyond Space (1958) considered suing for plagiarism because they thought the plot for Alien was too similar to their movie. Veronica Cartwright played Rod Taylor’s little sister in Hitchcock’s The Birds. She was chosen for the role of Ripley only to show up on the costume set to find out she was playing Lambert instead. Peter Mayhew who played Chewbacca in Star Wars wanted the Alien part. The part was given to Bolaji Badego, a young African design student discovered by Ridley Scott. And lastly, Scott named the Nostromo’s computer, Mother, thinking how it related to the Alien’s eggs on the crashed ship. This is one of my all time favorite science fiction movies. I watch science fiction films all the time and enjoy them!! Alien and Aliens are awesome films to me because my older son and I watched them over and over. My son even has action figures of the Alien creatures. I love science fiction movies so much that my husband is taking me to see Piranha in 3D this week-end. Yes, my husband truly loves me that much!! I know it will be cheesy, have terrible acting, and poor special effects compared to Alien, but I am a true sci-fi movie fan, and I will love it anyway. Aki, this is a very entertaining review of one of the most influential sci fi films of its time. Personally, I much prefer ALIENS, in large part because of its clever motherhood theme. But there's no denying that ALIEN broke the sci fi action movie mold with its female heroine (I think Princess Leia plays strictly a supporting role in the SW films while Ripley is the main attraction in the ALIEN pics). I really enjoyed all your trivia, which reminded me of when my wife, a friend, and I used to do a monthy movie radio show. We'd chat about movies and answer questions from anyone that called in. One fervid ALIEN kept calling and asking detailed trivia questions about ALIEN. I couldn't answer any of them (having only seen it once before the video explosion). I hope that fan finds your marvelous review and enjoys it. Also, you should review the original PIRANHA some day. It was kinda fun. Aki, one of my favorite things about the Cafe is reading articles that shine with the enthusiasm of the author. You make "Alien" come to life in your passionate writing! I loved your take on this classic and think you should be hired to do P.R. for the film! I also loved your review because you explained about sharing your movie experience with your son. Sometimes a movie takes on a whole new meaning when it is shared with others. I also liked your title because it reminded me of the philosophical riddle "If a tree falls in the forest and no one is around to hear it, did it make a sound?" Excellent and informative review. Well done! Great write up of one of the scariest films I have ever seen. I was totally shocked when I first saw the chest burst scence and the film creates a nervous tension the whole way. It was definitely ahead of its time in terms of shock factor and done in a classy way. Looking at a lot of the current gory horror films they cannot compare in to the class of Alien. This film is a classic and thanks for the great article. Sigourney Weaver as Ripley. Aah, she was my sci fi action girl until Milla came along in the RE movies. Thought your review was fun. Aki, I love your title for this article - very clever and funny. I am also an Alien lover and will never forget that scene with Kane. My sister was so upset she got up and left the theater. I told her she was a wuss, and it's a running joke now - I just put my hand under my shirt, push it forward and make gagging noises! I also thought Aliens was one of the few sequels that was as good a movie as the first. The first will always be the greatest, though, as a real groundbreaker. I had heard about the surprise to the actors when the chest split and blood splattered. What a shock! The whole audience screamed as well. That's the fun of seeing movies in the theater. Great review, Aki. Aki, My husband and son both love this movie. For me besides the ALIEN, the scariest part of the movie was the feeling of the claustrophobic ship. Awesome review, Aki! Superb review of a deserved classic! I love the ALIEN series (even ALIEN VS. PREDATOR), but Ridley Scott's first one is still my fave. I'm amazed by the film's influence, which still holds true today. The "alien birth" scene is constantly lifted for other films, and there are a number of movies with aliens that look similar to H.R. Giger's design (namely the elongated head). Scott made a film that was exciting, scary, and suspenseful. It's also quite innovative. One scene that stands out for me is when Scott actually shows you the alien before it attacks, camouflaged somewhere on the dark ship. Looking at it retrospectively (knowing what the alien looks like), you can clearly see it, but back then viewers may have seen it or maybe just thought they saw something. It's a clever way to shoot the sequence, by building suspense subconsciously! I'm also a great fan of the strong female characters. Film theorists will sometimes argue that physically strong female characters have to be "masculinized" to compete with the men. This is a lame example, but in G.I. JANE, Demi Moore has to almost become a man to prove herself. Sigourney Weaver, in contrast, is not only an astoundingly strong female as Ripley, she's also quite stunning. Male viewers don't stare at the screen just because she's fighting an alien. In addition to IT!, screenwriters Dan O'Bannon and Ronald Shusett have been accused of stealing the plot from Mario Bava's PLANET OF THE VAMPIRES. Again, a wonderful write-up, Aki, of a terrific film. This was so enjoyable to read and makes me crave an ALIEN marathon, even though I just ran one a couple of weeks ago. Maybe someday you can review James Cameron's 1986 sequel! Wow, thanks for the nice comments. Rick, I recently saw the original Piranha with my sons. I would love to do a review on it. Toto, I love your philosphical riddle about the tree. Anon. and Doc, I think it is the scariest movie I have ever seen. Becky, I loved the story about your sister and how you pretend to have an alien coming out of you. Dawn, I forgot to mentioned anything about the claustrophobic ship but that would have been a great thing to add. Milton, I love the Resident Evil movies and I am a big Milla fan myself. Can't wait for the new RE to come out! Sark, I have one thing to say to you...you could have reviewed this film much better than me! I love Alien vs. Predator too.